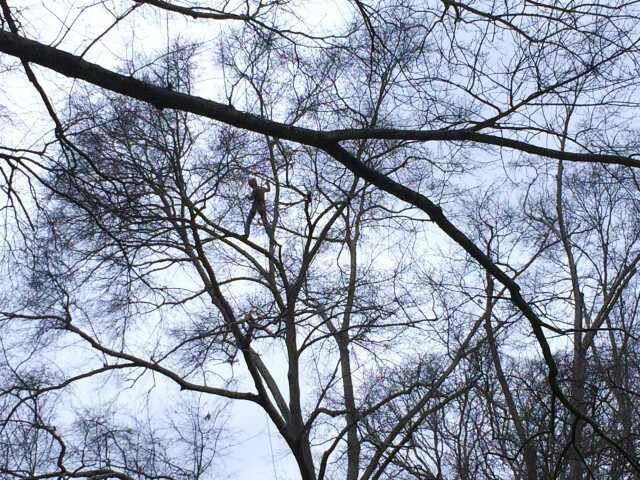 This week, Heath Tree Service has been pruning Mistletoe from some beautiful Oak trees in Buckhead. If you have been experiencing issues with Mistletoe, call Heath Tree Service today and let the experts take care of it! 404.261.5000. Mistletoe is a parasitic plant that can reduce the growth and vigor of your trees and expose trees to attacks by diseases and insects. Mistletoe is great when you finally find yourself kissing under it, but not if it is in your trees. What does it do to my tree? Mistletoe starts as a small white berry that is eaten and spread by birds. Around six weeks after being left by a bird on branches, the seed germinates and produces roots that tunnel through the bark and inner tissues. Mistletoe has leaves to produce its own food, but steals water and nutrients from its host. It can cause branches to die back, and heavy, shrubby mistletoe can break entire limbs. You may notice that portions of the branch beyond the mistletoe cannot produce leaves or experience die-back. It most commonly effects hardwood trees like Oak and Maple. By depriving the tree of water, mistletoe stresses the tree and leaves it susceptible to diseases, drought, and insects. How do I get rid of mistletoe? Luckily, mistletoe is an obligate parasite. This means mistletoe can only survive as long as it’s host branch is living. As soon as the host branch is pruned from the tree the mistletoe will not be able to survive. In order to prevent regrowth, the branch must be pruned around 1-2 feet from the mistletoe. The root system of the mistletoe can extend about a foot in either direction into the branch of it’s host tree. In severe infections, pruning all of the infected branches may not be a possibility. A Certified Arborist can help you make your decisions on pruning or trimming your trees. If a tree is badly infected with mistletoe, removing all of the mistletoe at once may leave the tree bare without enough foliage to gather nutrients and for photosynthesis to occur. One of the Certified Arborists at Heath Tree Service can help you eliminate the mistletoe in your trees, before it becomes a problem.